Nothing says summer to me like prawns being grilled on the barbecue. Often that will mean garlic, olive oil and plenty of lemon juice and pepper, but I also love chargrilled prawns with the darkly salty tang of this Korean-style chilli sauce. This is such a great dish for relaxed entertaining, with plenty of napkins, ice-cold drinks and the languor of the summer holidays taking hold. These will be delicious cooked on any style of barbecue, but the heat and character you get from real coals makes a big difference. 1. Take the prawns off the grill just before they're completely cooked; they'll finish cooking by the time you've plated up and you'll avoid powdery meat. 2. Firm the prawns in the freezer for 30 minutes to make them a little easier to handle when you butterfly them. 3. The sauce can be made ahead, and it's also delicious on whole grilled fish or as a chilli condiment with almost endless uses. 1. For the gochujang chilli sauce, add all of the ingredients to a saucepan and simmer for five minutes until the sauce thickens slightly. Tip into a bowl and set aside to cool. 2. Preheat the barbecue grill until hot. 3. Using a sharp serrated knife, butterfly the prawns by slicing lengthways through the back of the shell, including the head, until you can open them out flat – you could also cut the shell with a pair of kitchen scissors and open the tail out with a knife. Remove the intestinal tract and wipe out the heads with paper towel. Brush with oil and season lightly. 4. 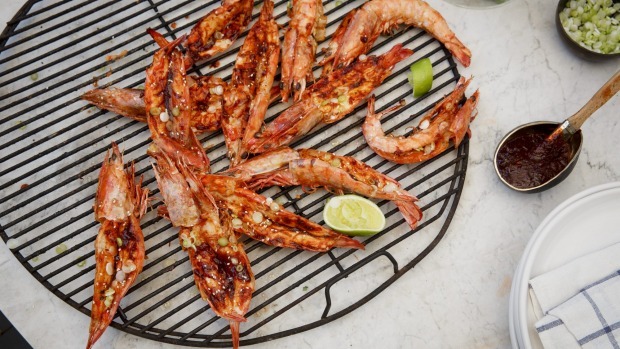 Grill the prawns for one minute, flesh-side down, flip and grill until just about cooked. Remove the prawns from the barbecue and brush with the chilli paste. Squeeze over some lime, sprinkle with spring onion and sesame seeds, and serve with the snow pea tendrils (if using). Drink A fresh lime cocktail such as a caipiroska or icy lager.